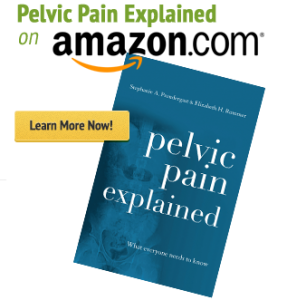 As you may know, us pelvic floor physical therapists tend to talk about the pelvic floor muscles quite a lot. However, we also assess and treat many other muscles surrounding the trunk, pelvis, hips, and thighs, that influence pelvic health and various pelvic floor muscle dysfunctions. If you’d like to learn about pelvic floor muscle anatomy, check out this previous blog post: Your pelvic floor: what is it good for? I am going to take you through some of the muscles I commonly find impairments with, and treat in conjunction to the pelvic floor muscles. Ilium: the largest pelvic bones – when you put your hands on your hips you are touching the ilium. Ischium: the part of the pelvis that you sit on (aka sit bones). 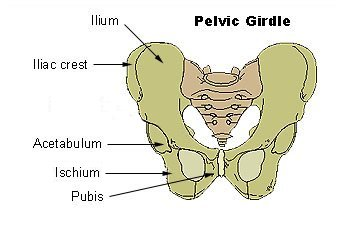 Pubis: the front part of the pelvis that joins both sides together via the pubic symphysis. Sacrum: the sacrum attaches to the ilium via the sacroiliac (SI) joint. Coccyx: also known as the tailbone, and attaches to the lower part of the sacrum. 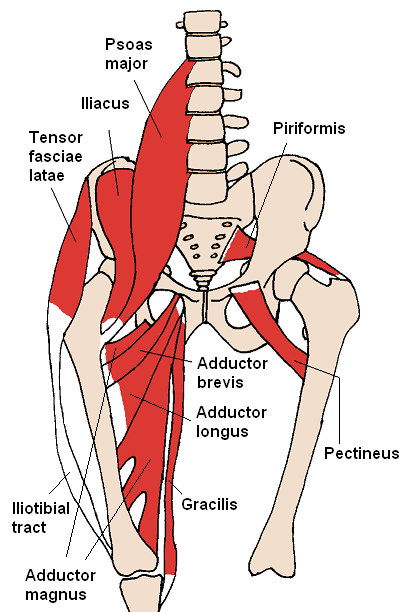 Hip Flexors (Iliopsoas): The psoas and iliacus muscles join together at the attachment on the femur. Attachments: the lumbar vertebrae from T12-L5 to the femur. Actions: hip flexion, balances trunk in sitting position, trunk flexion, trunk side-bend. Attachments: the inside of the pelvis at the ilium and iliac fossa to the femur. Actions: hip flexion, stabilizes hip joint. If the iliopsoas muscles are tight or if there are myofascial trigger points in the iliopsoas muscles, this can lead to anterior pelvic tilting, abdominal/anterior hip/groin pain, and low back pain. The hip flexors are put into a shortened position when in a sitting position, and are used when walking, running, hiking, and going up stairs (to name a few activities). Attachments: the pubis to the femur. Actions: hip adduction (brings thigh inward towards other thigh), partially used for hip flexion and extension. Myofascial trigger points in the adductor muscles refers pain to the upper inner thigh area, and is a leading cause of groin pain. Adductor muscles are commonly contracted when people have urinary urgency and urinary incontinence to try to (ineffectively) prevent leakage and ‘hold in the pee.’ The adductor muscles also tend to contract when pelvic floor muscle weakness is present, as a way to compensate for the weakness. Attachments: the sacrum and sacrotuberous ligament to the femur. This muscle is located deep in the buttocks (under the gluteals). Actions: Externally/laterally rotates the thigh, abducts flexed thigh. Tightness in the piriformis muscle can be linked to sciatica (nerve pain down the back of the thigh), due to the muscle’s proximity to the sciatic nerve. Myofascial trigger points in the piriformis muscle can lead to referred pain at the mid to upper buttock area and the pelvis. Attachments: The pubis and ischium to the femur. Tightness and/or myofascial trigger points at the obturator internus muscle can lead to referred pain into the coccyx/tailbone and deep pelvis. *Take a look down at your legs when you are standing and walking, are your knees and/or toes turned outward? If so, you might have tight hip external rotators. These three muscles together form what is known as the hamstrings. Hamstring tightness can lead to posterior pelvic tilting, and myofascial trigger points can lead to referred pain up into the buttocks, and down the leg behind the knee. 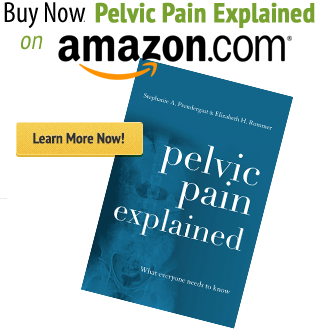 Low abdominal, pelvic, groin, buttock, and tailbone/coccyx pain may be from muscles surrounding the pelvis, and not the pelvic floor muscles themselves. Even though we are called pelvic floor physical therapists, it is our job to assess and treat all aspects related to your pelvic health. This may include manual therapy and trigger point release of muscles in the abdomen, hips, buttocks, and thighs. It is also important to assess posture and pelvic alignment,and to evaluate whether your body is compensating for tight and/or weak muscles that can contribute to pelvic floor muscle dysfunction. Netter FH. Atlas of human anatomy. 6th ed. Philadelphia, PA: Elsevier Inc.; 2014. Travell JG and Simons DG. Myofascial pain and dysfunction: the trigger point manual. Volume 2. Baltimore, MD: Williams & Wilkins; 1992. Great summary and right on point;, thanks for sharing it with us. Great info. Do you see patients? Yes, Shannon treats patients in our Lexington and Natick office. Please call to schedule an appointment. Very informative. Thank you so much. I’m not saying I understand it all but it might help explain some of my symptoms.